I love borough Market in London. Going to a market is one of my favourite ways to spend an afternoon. I could spend hours looking at all the gorgeous and different types of foods and ingredients. From gourmet meats and fresh produce to quality Italian cheeses and spanish olive oils, there is so much to indulge! My latest Borough Market treat was a very fresh pumpkin and goats cheese ravioli from La Tua Pasta. I wanted to taste the pumpkin and goat cheese filling as much as possible so didn't want to cover the pasta with any sauces. Instead I just drizzled extra virgin olive oil, sprinkled with some salt & pepper, crumble bacon, parmesan and fresh chopped basil. Very tasty!! This will be my entry for this weeks Presto Pasta Night (#114) hosted by Kitchenetta of Got No Milk. I don't send one in every week but I certainly keep my eye on weekly round-ups! Gives such inspiration. I love all the imagination everyone shares. It really is worth a peek! Thanks for your entry Sarah. That sure looks good, and I LOVE the Borough Market - it's a foodie's delight. I was there last year. Lucky you to live so close. The ravioli looks so fantastic, that although it's only breakfast time here...I want a bowlful right now. Markets are wonderful and Borough Market is on my list to visit when next in London. Pumpkin and goat cheese what a combo! Looks wonderful. I love goat cheese. That looks & sounds delicious! 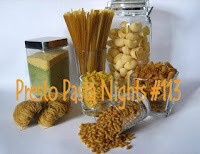 Thanks for coming over to my blog, I'm a drop in once in a while member of presto pasts nights too.